Explore art and mindfulness for the first new moon of 2019!New moons are a time for planting seeds (literal and figurative) and setting intentions. 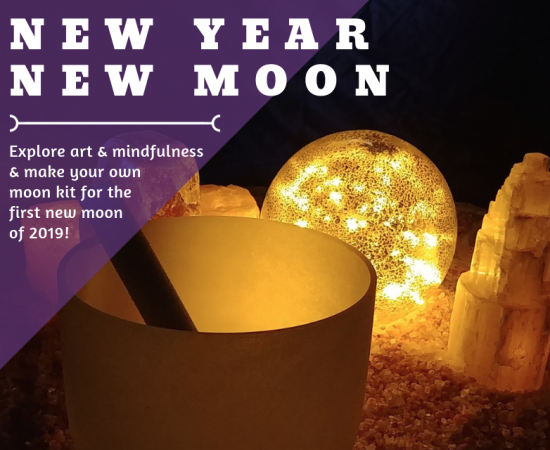 What better way to start 2019 than by creating your own new moon kit to help you renew and compose yourself for the coming year. Each new moon kit will include items such as bath salts, essential oil blends, and candles. Then design and personalize your own kit as well as write out your thoughts and intentions for the new year and new moon! Come in comfy clothes and bring a pillow and a blanket for sound healing, Reiki, and a guided meditation from certified Reiki practitioner, Jasmine Eastburn. And there will be tea (duh)! A special blend for the evening and generic. Don’t miss this one opportunity of the year!